From the way you handle money to what you eat to the people you choose as your friends and companions ... there is a specific reason for every single thing you do in life. And those reasons are part of the programming found in your subconscious mind. If you want to create real, permanent changes, you need to communicate with your subconscious by speaking the "language" it understands. When you do, you will have the power to rewrite the script that directs your thoughts and behaviors, and begin effortlessly creating exactly the life you desire - a life based on good health, self-fulfillment, self-empowerment, and happiness. * Releasing counterproductive behaviors, such as smoking and overeating. * Retaining a positive attitude. * Relaxing and enjoying a better night's sleep. * Eliminating bad financial habits. * Increasing memory retention and concentration ability. * Overcoming shyness and improving speaking skills. * Maintaining peace of mind and controlling anger. * Recovering from surgery faster and with better results. 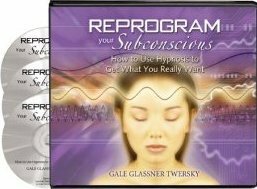 Whatever your subconscious may have chosen for you with "good intentions", but without your awareness or permission, you may reprogram through hypnosis. In this series, you clearly learn how to accomplish this - easily, comfortably, and very time efficiently.